Science Rationale for an Io Volcano Observer (IVO) Mission by Alfred McEwen et al. My summary. 4:15 pm - Modeling the Sublimation-Driven Atmosphere of Io with DSMC by Andrew Walker et al. My summary. 4:30 pm - Io's UV-V Eclipse Emission: Implications for Pele-type plumes by Chris Moore et al. My summary. DSMC Modeling of the Plume Pele on Io by William McDoniel et al. My summary. Volcanism on Io: Results from Global Geologic Mapping by Dave Williams et al. My summary. Paterae on Io: Insights from Slope Stability Analysis by Laszlo Keszthelyi et al. My summary. 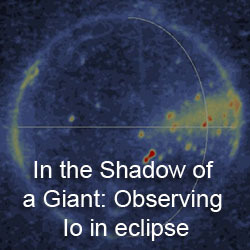 Io: The Dark Paterae Component of Heat Flow by Glenn Veeder et al. My summary. 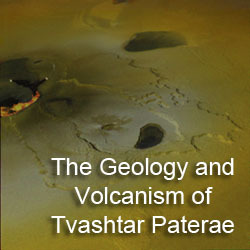 Distribution and Comparison of Io's Paterae: Areas, Effective Diameters, and Active Volcanism by Brandon Barth et al. My summary. The Thermal Signature of Volcanic Eruptions on Io and Earth - Implications for a Future Mission to Io by Ashley Davies et al. My summary. The Geothermal Gradient of Io: Consequences for Lithosphere Structure and Volcanic Eruptive activity by Giovanni Leone et al. My summary. Also if you or someone you know will be blogging or twittering from the conference, send me a note and I will post a group of links to them in a post tomorrow. Welcome to The Gish Bar Times, the only blog dedicated to Jupiter's volcanic moon, Io! 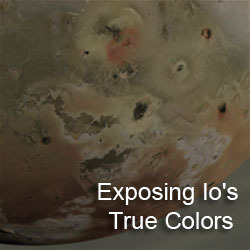 Here we cover Io-related news: new volcanic eruptions, published papers and conference abstracts, new images (or reprocessed older images), and news regarding upcoming missions to the Jupiter system. Budgets, Carnivals, and Cryovolcanoes, Oh My! I work for the Cassini Imaging team, usually processing Titan and Enceladus images and making maps of Titan based on our images. When I am not working or studying, I'm...I forget. I watch a lot of movies I guess. Opinions expressed on this blog are those of Jason Perry, and not of his employer or academic institutions going back to pre-school.